All natural Skin care products made on our farm in Stokes Country, North Carolina. Most of are skin care products match or associated with our all natural cold process soaps. All natural skin care products have you covered from head to toe. Our Mocha Java Lip Balm is made from Coffee Butter, Cocoa Butter and beeswax. Simply Body was developed in the 60's by a Swiss chemist. The result was no-slip soap that produced instant lather and a rejuvenating washing experience that eliminated the washcloth and the messy soap dish. Today, the Simply Body experience has been perfected. The fine net not only produces a luxurious lather, it also massages your skin and improves circulation. It is a simple and reusable, way to deep cleanse and eliminate dry surface cells to reveal brighter healthier skin. Simply Body Soap Net is made in the USA. 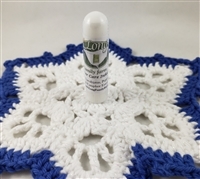 Soap NOT included Long Family Farm Inhalers contain only essential oils. Ingredients: Water, Witch Hazel essential oil. Four oils and 2 butters make this lotion light and super moisturizing. It is also absorbed easily by your skin. Long Farm Lotion is made from water, Avocado Butter, Avocado Oil, Cocoa Butter, Jojoba Oil, Macadamia Oil, Almond oil, Beeswax, Peppermint Essential Oil, Lecithin and Borax. 3/7/2019 We have added lecithin to our lotion. Lecithin is an emulsifying agent. The lecithin, we use, is naturally derived from soy. I have chosen these oils carefully. It's been known to be especially suitable for eczema, itchy, dry and inflamed skin. Almond oil’s properties even extend to having benefits for our hair. Massaging a few drops of almond oil into your scalp adds a healthy glow to your hair. Also, it helps make your hair stronger, thicker and adds shine as well as nourishing and smoothing hair cuticles. Macadamia Oil is a skin lubricant and is easily absorbed by the skin; it is sometimes described as the "vanishing oil." It is helpful in cases of sunburn and wound healing. For mature skin it is hydrating and gentle. Jojoba is very similar in composition to human natural skin oils. It penetrates the skin rapidly to nourish it; also softens and moisturizes mature and dry skin. Avocado oil nourishes and restores dry, dehydrated, and mature skin. It is rich, heavy oil that is rich in vitamins A, B1, B2, vitamins D and E, protein, pantothenic acid, and fatty acids. Get a great cloth, donate to a great cause. Ingredients: Macadamia Nut Oil, Babassu Oil, Shea Butter, Cocoa Butter, Arrowroot powder and essential oil. Ingredients: Cocoa Butter, Kaolin Clay, Beeswax, Almond Oil, Tea Tree and Lemongrass essential oils. The Kaolin Clay in our all natural deodorant is designed to soak up your sweat. The Tea Tree helps to get rid of the bacteria hence helping prevent odor. Tea Tree by itself is very strong so we have added some lemongrass to help calm the "tea tree" scent. The cocoa butter and almond oil are used to apply these other ingredients. It's a rather simple process. 5/3/2018: We changed our deodorant recipe. When we studied this product, most everyone called for shea butter, which is not a butter we use very often. The shea butter seems to be sticky and does not spread well, so we are going with cocoa butter, which is my go to butter and melts well on contact with skin. We will also be using almond oil. We are really happy with the test results. Ingredients: Pink Himalayan Salt (grain size: Powder), Macadamia Nut Oil, Geranium and Bergamot Essential Oils. Stir product well before using. Macadamia (Nut) Oil: Macadamia Oil is a skin lubricant and is easily absorbed by the skin; it is sometimes described as the "vanishing oil." It is helpful in cases of sunburn and wound healing. For mature skin it is hydrating and gentle. We recommend Long Family Farm FACE soaps when you are not using our Facial Scrub. Our FACE soap contains 1/3 cocoa butter and 5 other moisturizing oils. Our black FACE soap contains Activated Charcoal which is reported to help detoxify the skin. You will find our FACE soap in Specialty Soaps section of our Soaps Page.